My maternal Dewsbury family has seen me reach back to my 7x Great Grandparents, John Dewsborough and his wife Edith Langford who lived in the village of Soham in Cambridgeshire, England during the late 1740s. However, my closest Dewsbury ancestor was my 3x Great Grandmother Elizabeth Dewsbury who was born in the village of Stretham in 1851. My Dewsbury ancestors lived in the fenland surrounding Ely for many successive generations, and of those I've been able to confidently trace and attach to my tree seemed to left the large village of Soham, where they appear firstly in 1749, and began being noted as resident in 1752-1753 at Barway, and then they shift a few miles to nearby Stuntney from 1757 until 1768. The earliest reference of my ancestors - the marriage of 'John Dowsborough' to Edith Langford - appears in the Soham parish register in 1749. It is followed by a string of baptisms for their nine children over the years, before John dies and is buried in 1769 at Ely Holy Trinity. At this time, John is noted in the Ely burial register as from 'Half Acre in Soham' (rather than from Ely), and this also explains why their family stops at 9 children. John and Edith's final child Frances Dewsbury, was baptised in 8th May 1768 at Stuntney, allowing the dates to coincide perfectly. Edith, or 'Edy' as she's noted in July 1769, re-married to Thomas Segirs at Soham, and it is unclear what happens next. It seems that they left Soham. Over the generations, the family can be followed to neighbouring villages such as Stuntney, Little Thetford, Stretham, and the hamlet of Barway. By the time the 19th century arrives, my 5x Great Grandfather Edward Dewsbury and his wife Sarah (her name remains a mystery for now), were already three children in to their eventual family of 10. Edward and Sarah had settled at Wilburton, Cambridgeshire - only a few miles west of Ely, and they became parents to an eventual family of 9 daughters and 1 son, although at least one child died in infancy. That son was my 4x Great Grandfather William Dewsbury. William remained in agriculture, like his ancestors, and after marrying Rebecca Lythell in 1840 at Stretham, the couple settled there to have 12 children. Among these was my 3x Great Grandmother Elizabeth, who would eventually go to marry into the Barber family, therefore ending my Dewsbury ancestry. I also have a second Dewsbury family connection, but this one is not ancestral.. or at least it's not yet. Again, this branch appears in my maternal family, but sees a Laura Dewsbury marry my 2x Great Grandfather's younger brother Owen Yarrow at Little Thetford in 1905. Laura was one of the 11 children of Henry James Dewsbury and his wife Mahala Randall, who raised their family at Barway - a hamlet of Soham. 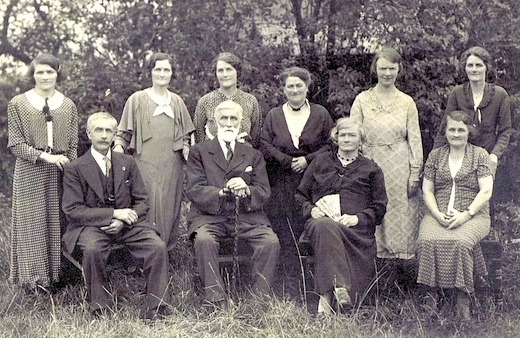 This family group lived at the Water Mill at the River Ouse, operating a chain ferry between the Barway and Little Thetford riverbanks. Above: Henry James Dewsbury and wife Mahala (née Randall) celebrating their 50th wedding anniversary in 1925. Photo: John Kent/Julie Claydon. Whilst this family remains unconnected so far, for two large but separate Dewsbury families to be living among each other in these Cambridgeshire villages would be very unlikely. The surname isn't common in Cambridgeshire beyond this small collection of adjacent fenland villages. The most likely connection point to my ancestral family, would be Laura's Great Grandparents James Dewsbury and Lucretia Hazelwood who married in 1811 at Soham. I suspect that James is the brother of my 5x Great Grandfather Edward Dewsbury. Modern-day descendants - John Kent, and Mike and Julie Claydon, have been researching this unconnected branch, and we may one day confirm that connection. The origins of the Dewsbury surname might suggest that it's a geographic name - taking its name directly from Dewsbury in Yorkshire, England. However, I have not yet identified any documented evidence that suggests that my Dewsbury family came from this location. In addition, there's so many variants of the surname in the records I have seen, that the surname could easily come from Desborough in Cambridgeshire's neighbouring county of Northamptonshire. Fellow Dewsbury researcher John Kent has been researching the family, and has documented his research and some of his variant finds on his website.